The sweetest cat we have ever known left us yesterday. She went to a healing home in the inner worlds. But our world will never be the same without her. We found this little black-and-white ball of fur in a bin full of kittens at the animal shelter. Linda said to all the kitties, “You are so cute. I have no idea which one of you should be ours.” She put her hand, palm up, inside the bin. Cuddles peered up at Linda from the back of the bin. She jumped over all her littermates and landed in Linda’s hand. Cuddles was The One. She had chosen us. About the time Cuddles arrived into the Anderson household, we were starting our first Angel Animals printed newsletter. The concept that animals are spiritual beings, messengers who show us what God’s love is, intrigued the news media. Before we knew it, newspaper reports and local television crews were coming to our home and interviewing us. Cuddles became our publicist, hostess, and model. She scratched at the front door as journalists arrived and made a brilliant first impression. She curled up on reporters’ laps and posed for photographers. Everyone was so charmed that she served as the image of Angel Animals without ever saying a word. Stories about our new project, which by then had morphed into our first book proposal, made it into national wire services. Cuddles, stretched out on our living room coffee table or sofa, caressing readers with her lustrous emerald eyes, made it into newspapers all over the country. Cuddles loved to curl up on Allen’s big blue chair and watch him work in his home office. She ruled him and the house. We all loved and accepted her benevolence. He enjoyed taking pictures and videos of her as she orchestrated the impressions she wanted to make. Today, our family is bereft and grieving. Our little cocker spaniel Leaf, who was smart enough to do whatever Cuddles told him, is lethargic and sleeping all day. Our yellow cockatiel Sunshine wouldn’t come out of his cage this morning. Cuddles passing has left a big hole in our hearts. As the veterinarian helped Cuddles leave her sweet body, we sang HU, a sacred love song to God, and tearfully said goodbye to our wonderful friend. She left peacefully, gracefully, and with utmost dignity, just as she had lived her life. Her spirit lives on as a great and wise Soul moving on to her next spiritual adventure. We love you, Cuddles. We miss you, Cuddles. You always lived up to your name, Cuddles. Thanks for being a precious member of the Anderson family. We have Saturday rituals. We tell our dog Leaf that Saturday is a day of great adventure and fun. Our bird, Sunshine gets new millet on Saturday and a complete cleaning of his cage. The cats, Speedy and Cuddles, also have a Saturday ritual that involves new kitty litter and Allen’s purchase of their favorite cat food. Leaf’s alert attention to every turn helps Allen drive Linda to the screenwriting group she attends three Saturdays each month. The meeting is in the city’s center, and Leaf is fascinated with all the downtown activities. He watches with a mixture of concern and excitement when Linda leaves the car to enter the front of a high-rise building. After the visit to dog park Allen and Leaf go to a local, small pet supply store to buy the very best dog, cat, and bird food. The boxes of dog treats are at floor level and they turn Leaf into a shoplifter. He also enjoys the row of dog toys and buckets of chew bones. Because there is so much to smell and experience, Leaf is excited at this store, bouncing from one thing to another. He sniffs, explores, and enjoys every moment. This morning, when Allen and Leaf were in the aisle that had anti-itch spray products for the cat, Allen was reading ingredients while Leaf poked his nose into each toy to discover which ones squeaked. A ten-year-old boy came up and asked if he could pet Leaf. Allen said yes. Still hyper from the nearness of so many goodies, Leaf ran over to the boy for a quick pat on the head. Then he rushed back to the toys to continue his investigation. The little boy replied, “Yes, it does.” He added that his dog had died of cancer and lost any awareness of where he was at the end. Leaf stopped poking his nose at the toys. This seemed odd, because nothing distracts this dog from a good toy hunt. But now, he seemed to be listening as the child spoke with such sorrow about his dog. Abandoning the search for a perfect squeaky toy, Leaf walked back to the boy. This time, he stayed a little longer as the child petted him. Allen remained quiet while Leaf comforted this grieving child. When Leaf moved away from the boy this time, he did not rush but walked with more of a deliberate and focused presence. The boy looked up at Allen. The sparkle in his eyes revealed that our healing little cocker spaniel had silently, for a moment, lifted the burden of loss from his heart. He said thank you and went back to his parents. Leaf keeps his secrets to himself, so we don’t know exactly why he does things like this. Our belief is that a loving animal like Leaf is an instrument of the Divine. Someone’s heart is broken, and Spirit directs a creature with a wagging tail, soft fur, sweet eyes, and a kind heart in the direction where he’s most needed. What do you think? Has an animal intuitively sensed that you needed comforting and gave it to you? In our books we often write about the sacred agreements animals and people make to find each other and be together. Those of you who have been chosen by an animal know what we’re talking about. You’ve experienced the certainty an animal has about being with you. But it’s also true when we, as humans, do most of the choosing. A connection is made, sometimes love at first sight, that cannot be denied. We look into the eyes of this animal and just know the relationship was meant to be. The animals who have blessed our lives brought confirmation of our spiritual agreements to give and receive love, to learn and teach each other. But one of our many pets over the years keeps drifting back to mind as a most gentle companion and soothing family member. Her name was Sparkle. She was a gray cockatiel with bright orange spots on her cheeks. Unlike her mate Sunshine who thankfully is still with us long past what is supposed to be the lifespan for these birds, Sparkle had a patient, humble nature. Sunshine likes to strut his stuff, screech at the top of his lungs if there’s any disturbance in The Force, and let us know that he’s the boss of the living room. Sunshine speaks. Sparkle never uttered a word. When she was out of her cage, she’d perch on our shoulders and venture down our arms to peck at buttons on our clothes. It was lovely to watch her bend her head so that we could massage her feathery neck. While she walked along the living room mantel with Sunshine, she would thoroughly take care of her man, slipping his feathers through her beak until he was shiny and clean. Only a slip of a bird, Sunshine had tremendous will and determination to live. Struck down at a much too early age, she had to endure our giving her hormone shots, as we tried to save her. It was amazing to watch her level of trust. Somehow, she knew we only wanted to help, even though it must have hurt. How is it that so many years later, we still miss this elfin creature? She taught us that enormous love pours from the tiniest hearts. She made the soul agreement to love Sunshine and us, grooming his feathers and our hair, blessing us with her compassion. We made the soul agreement to care for and love her till her little body could no longer be with us. What a win-win situation. Who have you made soul agreements with? We are excited to be officially announcing the release of a groundbreaking book that we hope will fill you with joy at its simple truths and profound yet entertaining stories. 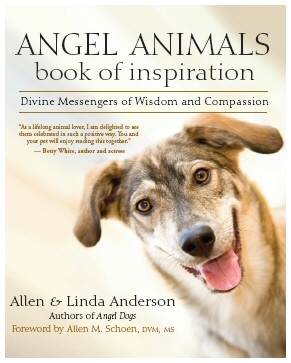 It is ANGEL ANIMALS BOOK OF INSPIRATION: Divine Messengers of Wisdom and Compassion. In these times of uncertainty and swirling negative energy, a book that fully delivers good news is needed more than ever. The first edition of this book was published in 2003 as GOD’S MESSENGERS: What Animals Teach Us about the Divine. New World Library has reissued it with a heart-opening new cover and updates. It’s arrived just in time for Mother’s Day gift giving! We are thrilled that our new book contains an original story from Richard Simmons about the incredible Dalmatians who cared for his mother Shirley. We’d like to give you a little insider-scoop on how Richard’s story came to be in our book. When we wrote to Richard to ask if there was a special animal story he wanted his enormous fan base of millions around the world to read, he called us and asked, “Allen and Linda, how can I help you?” Then he graciously shared an experience that had deeply affected him. As far as we know, Richard’s story is not in any of his other books or on his website. He wanted it to be in THIS book that would honor the spiritual contribution the dogs Brent and Rhett, his gifts to Shirley, had made to his mother’s life. These dogs had consistently reassured Richard that his mother was in good paws and eased his pain over her passing. On the NEW website we have designed to accompany the book www.angelanimalsbookofinspiration.com you’ll find over 20 of the endorsements and reviews about it’s amazing impact. But next, are a few of the comments reviewers and celebrities have made. Some of these extraordinary true stories will make you smile. Others will bring tears to you eyes. Each one will open your heart to new revelations of love in its many forms and shapes. At this time of year when thoughts go to renewal, rebirth, and life after death, we want to share a passage from our book on pet loss. Everyone who has a pet goes through this devastating experience at some time. But not everyone realizes that animals, like people, are so much more than physical bodies. They, too, are spiritual beings. Excerpted from SAYING GOODBYE TO YOUR ANGEL ANIMALS by Allen and Linda Anderson (New World Library 2007). Reprinted with permission. All rights reserved. such as a butterfly or rainbow, on a significant day or time. While we did the research for this book, we went through our files and found stories and letters about people’s after-death experiences with animals. All of the above examples actually happened to people. Some of them happened to us. If you are or have been dealing with pet loss, we hope this gives you hope to know that as difficult as it is, life does literally go on. Have you had an afterlife sense of a pet’s presence? Note: To subscribe to the Angel Animals Story of the Week newsletter, send a blank email to angelanimals-on@mail-list.com.